* Want clean garbage files regularly to save disk space? such as temporary files created by Xcode , safari , and system log files. * Want to monitor certain folders' size regularly? * Want to access your favorite folder quickly? This App can help you to solve all the problems. 1) Drag or add folders to app. 2) Setting folder task from menu. 1. How to add custom folders? 2) Drag folders from Finder to "Disk Cleaner"
3) If you can not access folders from Finder, you can execute command "cd FOLDER_PATH_YOU_WANT_TO_ACCESS" and "open ." from terminal, it will be opened in Finder, then you can drag it to App panel as option 2. 2. What's the most popular folder to watch? 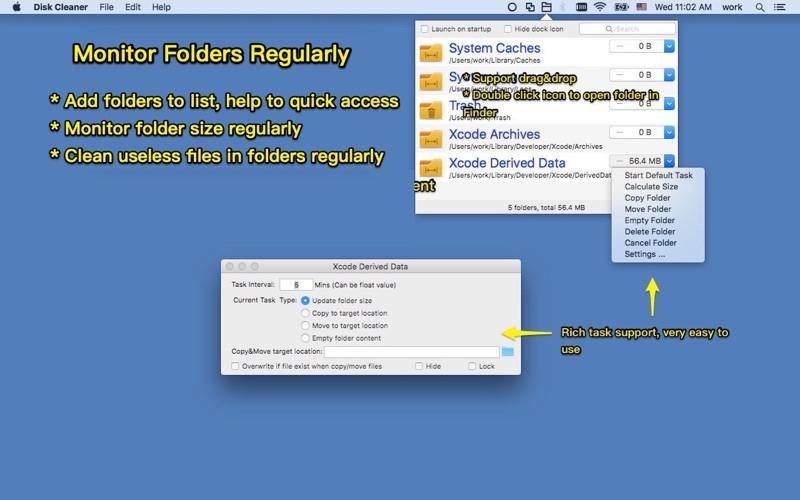 Please add/drag these folder from Finder to "Folder Watcher". "Folder Watcher" can empty these folder regularly to save disk space. 3. How to open folders in Finder? A: Double click the icon in front of the folder to open folder in Finder. * Add an "nothing" option to task type list, it is useful when users add folder to the list just want to access them quickly. * Support to sort folders by last access date.